One of the most important rooms in the house is the home office. It is the nerve center of the home, where you have your computer, store important documents, pay bills and even work from home, if you have a home business. It is a room that gets full of clutter from unused desk accessories and office equipment and don’t even talk about the bills and the paperwork that gets stacked on a desk in an office! 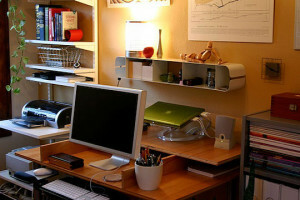 Having a clutter free and organized office is essential to keeping a family’s routine running smoothly. As with any reorganization project, it is critical to create a plan to reorganizing your office and even your desk. Once you have your plan and goals for the room in place, then you can start your reorganizing project. The first stop of the project should be to clear out the room and the desk. If doing both at the same time is too daunting, then start with the desk first and then work through the rest of the room. As with any reorganization project, you need to go through the items in the room and separate them into piles or boxes of: keep, store, donate, sell, or throw away. Don’t be afraid to throw away things that you haven’t used in quite a while. It is okay to throw out old office equipment, such as scanners, fax machines or printers that no longer work. If you have excess office supplies that are still in good working order, think about donating them to a local school. Throw out any old pens, paper clips and dried out markers or highlighters. Once you have gone through the sorting process, split the items that you want to keep into the following categories: desk supplies, work specific projects or bills and important documents. Shred old paperwork such as tax documents that are over 7 years old or credit and bank statements over 1-year-old. Self storage units are a great solution for storing excess office equipment. If you work out of your home, a self storage unit is a good place to store samples, inventory and paperwork in order to keep you home office clutter free. Storage World has 3 locations in Decatur, Stockbridge and Jonesboro in the Atlanta area to help with all of your storage needs from self storage units to moving and packing supplies. Once you are ready to put the items back into the space, utilize different organizational tools to keep the room clutter free. Office equipment that you should have in the room are: a filing cabinet, trash bin, shredder and recycling center. Add a desk organizer in your desk drawer for pens, paper or binder clips and other items that you would need most often. Set-up a personal filing system for your family documents and file the paperwork on a weekly basis. Also, utilize available wall space for storage by adding shelves and pegboards. Keep the items that you use the most within easy reach of your desk. You are more productive when items are closer to you, so you won’t waste time searching for paperwork when you need it. Organizing your desk and office can be an easy weekend project. The hardest part will be the sorting process at the beginning of the process and then keeping it clean after the project! If you feel that the paper and office equipment are starting to “take over” again, then go through the reorganization process again. It is a never-ending process, but well worth it in the end.